SOLD $399,000 USD One of a kind ocean view! PRICE REDUCED! 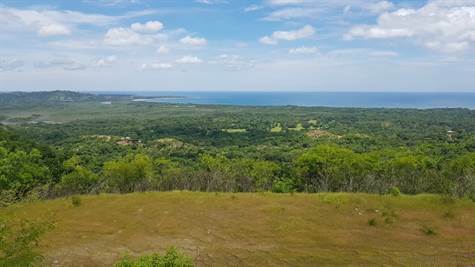 Located in complete privacy this lot gives you the feeling that you are on the top of the world, with nearly 360 degree views of Tamarindo bay, to the pacific ocean and east to the mountains and valleys of Guanacaste. Ideal location for a world class luxurious home with unforgettable views. The photos don't do the property enough justice, you must come see for yourself, this is an amazing place, and a one of a kind opportunity. Water and electricity are available for connection already at the lot line. The lot is complete with a large flat building terrace, no need for excavating or moving dirt. Corona de Playa Grande is secluded residential development with a gated entrance. A total of 29 home sites, 2 homes already built. Located on top of a mountain ridge high above Playa Grande, yet still so close to everything. Just a 3 min drive to the beach and surf in Playa Grande, less than 10 min away from major grocery stores, banks, pharmacies, and quality health care facilities. There are also several private schools within less than 20 min of the property.